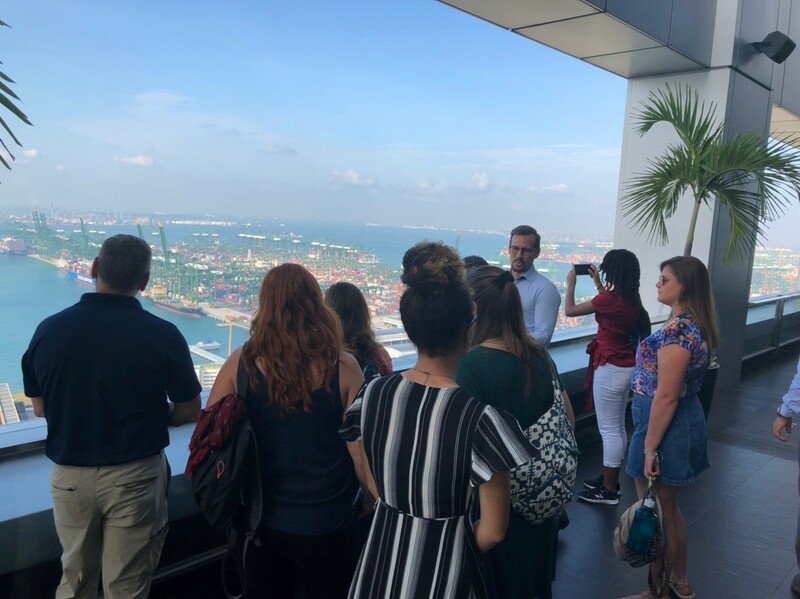 Four-hundred feet above tiny Singapore, we gaze out onto a green Pacific dotted with cargo ships as far as the eye can reach. Below, an industrial scene stretches infinitely westward, where crimson and navy shipping containers stacked one upon the other create a colorblocked maze, and the green silhouettes of cranes loom above the horizon. On this bright and impossibly hot morning we find ourselves at the Singapore PSA, the world’s largest container transshipment hub, in the company of our guide Mark, PSA’s jockey-turned-architect. Meticulously coiffed and sporting polka-dot socks, Mark guides us through the functionings of this globally significant port. This is a big deal– The nature of Singapore’s administration and high-profile engagements are secretive, shrouded from public scope and scrutiny. This is the way it is in Singapore. Despite our western perception of how closed off Singapore’s regime might appear regarding the way it functions, especially when national security is concerned, it has come a long way from its absolutist character of the 1970’s and 1980’s. As foreigners, we are privileged to have been given access to this high-profile port. 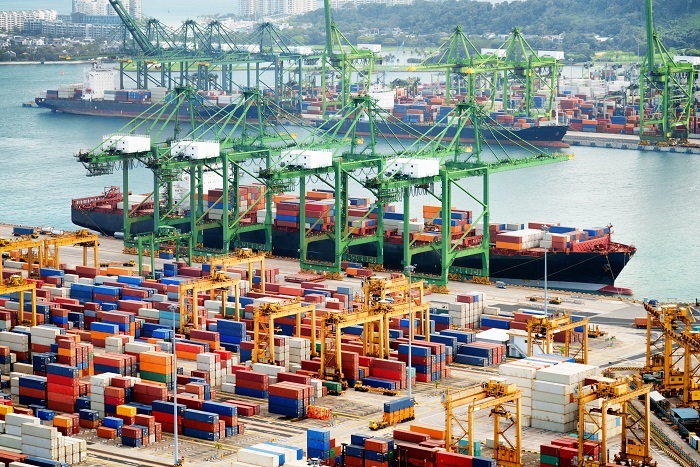 Each year, Singapore’s PSA is responsible for the handling of roughly 37 million TEUs (twenty-foot equivalent units), nearly half the world’s shipping container volume. What a paradox it is that one of the world’s smallest nations is home to the world’s busiest port. What were beaches just decades ago are now concrete terminals teeming with 220,000 shipping containers daily, fastidiously managed by 9,000 Singaporean and Malaysian workers, and the occasionally robot. Beyond the port’s security checkpoint, we drive past ships as long as skyscrapers, watching autonomous yellow bots bustle about the matrix of shipping containers. Imagine for just a minute a boat the length of four football fields, sixty meters wide, and forty meters in height. Hundreds of these colossal ocean giants, dubbed Maersk and Hapag-Lloyd, lug about Singaporean waters every day, each host to over 4,000 TEU containers in many cases. I was dumbfounded trying to even wrap my head around the amount of energy that must be required to move 800 of these giants and unload 220,000 TEUs in one day in Singapore. When Mark told us that 90% of world trade was carried out by international shipping, I was both shocked and horrified imagining what the energy usage and carbon footprint attributable to this amount of trade might look like. I was not surprised when Mark did not provide me a figure for the yearly emissions of the world’s busiest transshipment port. He did not fail, however, to point to the solar panels atop a port building, nor did he fail to mention that the new $10 million cranes employed by the PSA here are electric, saving 1,700 metric tonnes of carbon emissions yearly. Any effort undertaken to reduce emissions and dependency on fossil fuels must be celebrated and encouraged. But let’s put this into perspective. According to the World Bank, in 2014, average carbon emissions per capita in the United States were 16.49 metric tonnes yearly. To put it plainly, the electric cranes employed by Singapore’s PSA mitigates the yearly carbon emissions of 103 Americans. This lead me to two very bleak realizations: as Americans, our per capita emissions are alarmingly unsustainable, and as the world’s largest transshipment port in a country where $400 billion-(with a B!) is traded daily, can’t Singapore’s PSA do better? This ultimately brings me back to a question I’ve been pondering since our arrival in Singapore fourteen days ago: how do people go about holding large private companies and their government environmentally accountable in a regime where modesty, secrecy, and compliance are the norm? As we found out yesterday during a meeting with Singapore’s National Parks, Environmental Impact Analyses are not legally required in Singapore with issues regarding flora and fauna. 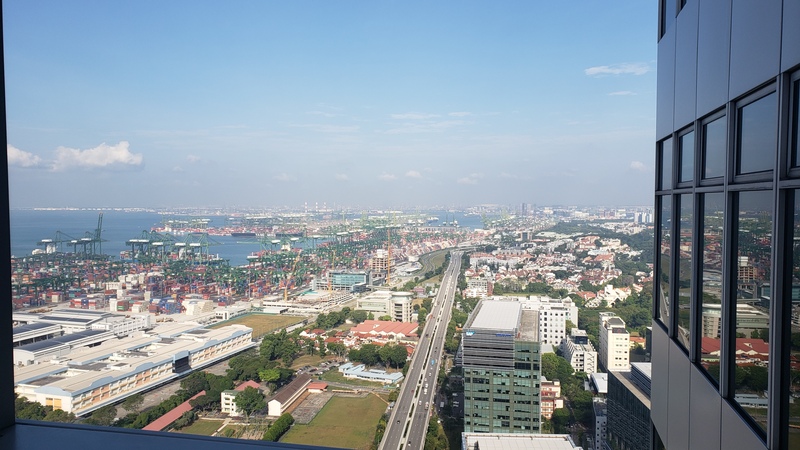 This means that unless a development activity occurs too close to one of Singapore’s National Parks, or unless a certain activity generates substantial public outcry, EIAs are not implemented, unless they are carried out by developers in ‘good faith’. If environmental concerns are not an administrative priority, how can we hold entities like Singapore’s PSA accountable? And how will we be able to quantify and qualify the social, environmental, and economic effects of the new Tuas mega-port under construction by the Singapore PSA? The two weeks we’ve spent exploring Singapore’s heavily modified and urbanized environment has taught us that here, development trumps all. But there is hope, namely in public outcry and the use of social media. That Singapore’s Kranji wetlands exist after ten years of relentless opposition among stakeholders is proof that citizen voices are powerful. In Singapore, and in the rest of the world, we must do our part to be outspoken and fight for the social and environmental issues we care about. As Dr. Dan has mentioned frequently throughout this trip, if we look at all of our environmental problems on a large scale, we get overwhelmed and discouraged. We must start small to make a difference.